ATTENTION ALL CHOCOLATE LOVERS: THIS CAKE IS FOR YOU!! As I was gathering ideas for Jessica & Brian’s wedding shower I came across this recipe, and I knew instantly I had to make it! If your household is anything like mine, with only the two of us I cannot bake things like this often. Trust me when I say it would not be good for our waist lines to leave a chocolate cake laying around for a week. I knew since I was baking for a group of 30 this was the prefect time to bake a cake like this. OH MY GOODNESS, talk about chocolaty heaven!!! This is definitely not a cake to make for a small gathering- the is a mega cake and it needs a party of people to help eat it! You can top the cake off with extra chocolate chips on top of the ganache or you can also use fresh raspberries! I hope you enjoy this cake as I much as I did! I am already looking forward to my next party or pot-luck at work where I can make this cake again!!! Make sure you have all the ingredients at room temperature before beginning. Preheat the oven to 325 degrees. 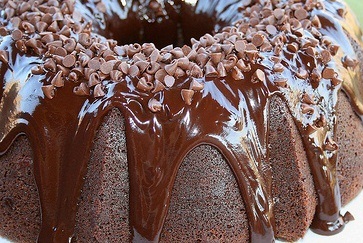 Grease your Bundt pan with Crisco and then dust the pan with cocoa powder. Tap out the excess powder and discard. In a small mixing bowl combine the cocoa powder and the chocolate. Add the boiling water and whisk until the chocolate is melted and the mixture is smooth. Set aside. In another medium sized mixing bowl sift together the flour, baking soda and salt. Set aside. In the bowl of a stand mixture fitted with the flat beater, beat the butter on medium speed until smooth and creamy, which will take 30-45 seconds. Reduce the speed to low, add the brown sugar and beat until the mixture is well blended. Increase the speed to medium and continue beating the mixture until it is light and fluffy, which will take about 5 minutes. Make sure to stop the mixer and occasionally scrape down the sides of the bowl. 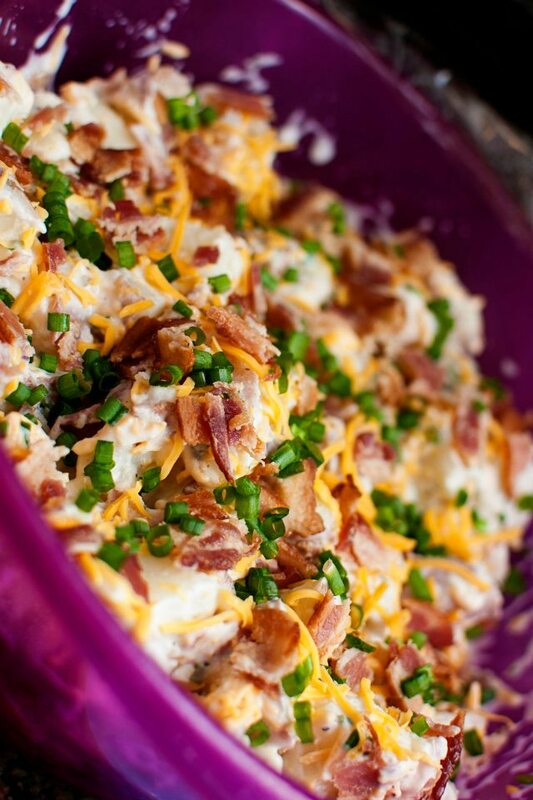 Once the mixture is fluffy, add the eggs a little at a time, beating until they are incorporated before adding more. Again, stop the mixer occasionally to scrape down the sides of the bowl. Once all the eggs have been added, beat in the vanilla until incorporated. Reduce the speed to low and add the flour mixture in three additions, alternating with the sour cream and beginning and ending with the flour. Beat just until blended and no lumps of flour remain. Do not over mix! Slowly pour in the chocolate-cocoa mixture and beat until no white streaks are visible, stopping the mixer occasionally to scrape down the sides of the bowl. Using a rubber spatula, gently fold in the chocolate chips. Pour the batter into the prepared Bundt pan, spreading the batter so the sides are about 1 inch higher than the center. Bake 60-65 minutes or until a toothpick inserted into the center of the cake comes out with only a few moist crumbs on it. Transfer the pan to a wire rack and allow the cake to cool upright in the pan for 15 minutes. Inverts the pan onto the rack and lift the pan off the cake. Allow the cake to cool completely for at least 1 hour. Make sure the chocolate is finely chopped before beginning to make your ganache! In a medium sized mixing bowl combine the chocolate and butter. In a small saucepan over medium-high heat, bring the heavy cream just to a boil. Do not boil the cream! Immediately pour the cream over the chocolate and butter and whisk until the chocolate is melted and the mixture is smooth. Source: adapted slightly from Lick the Bowl Good. What can I say about these cupcakes? THEY ARE AMAZING! Growing up I was never fan of white chocolate. It has a different taste over the traditional milk chocolate that kids are used to; however, the older I have gotten the more and more I enjoy white chocolate. I made these cupcakes as a dessert for Jessica & Brian’s wedding shower and they were perfect. The truffle in the middle is smooth, and the frosting is the most delicious part! (I was literally licking the bowl when I was done frosting the cupcakes!) 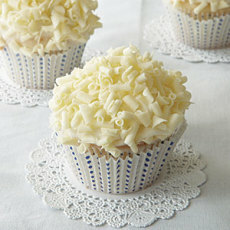 The cake portion of this cupcake is a heavy cake so if you are looking for a light and airy cupcake, this isn’t the one! Preheat the oven to 325 degrees, and prepare the cupcake tins by placing paper liners into the cupcake wells. In a small mixing bowl, whisk together the flour and the baking powder. In another small mixing combine the milk and the vanilla. In a large mixing bowl, using a hand mixer, beat the egg whites on high speed until stiff peaks form. In the bowl of a stand mixer add the butter and sugar. Cream them together on medium-high speed until light and fluffy, which will take about 5 minutes. Add in the sour cream and mix until smooth. With the mixer on medium speed, add the flour mixture and the milk mixture, alternating between the two and mix until smooth. Slowly mix in 1/3 of the egg whites. Using a large spatula, carefully fold in the remaining egg whites. Using a scoop, divide the batter evenly among the liners. Bake 17-20 minutes or until a wooen pick inserted in the center comes out cleanly. Remove the pan from the oven and using a small paring knife, immediately cut a 1/2″ deep “X” into the top of each cupcake and press one truffle into each cupcake. Remove the cupcakes from the pan and finish cooling them for at least 30 minutes on a wire cooling rack. Once the cupcakes are cooled you can begin to make the frosting. Place the white chocolate into a small microwave safe bowl and microwave on high for 1-2 minutes or until the chocolate is melted, stirring every 30 seconds so the chocolate does not burn. Allow the chocolate to sit for 3-4 minutes to cool slightly. In a bowl to a stand mixer, combine the cream cheese, butter, vanilla and the melted white chocolate. Using the paddle attachment, beat on medium speed until well mixed. Slowly add powdered sugar and mix well. Once the cupcakes are cooled, place the frosting into a piping bag and pipe frosting evenly around the tops of the cupcakes. Garnish as you desire! Source: adapted slightly from The Pampered Chef.